REGIONAL NEWS - U.S. & CANADA JUNE 2018 • E&MJ 13 www.e-mj.com life of eight years. Life-of-mine capital cost is estimated at $114.4 million after pre-development costs of $25.8 million. Mine construction capital is estimated at $46.6 million. All-in sustaining costs of production are estimated at $897/oz of gold pro- duced. The after-tax payback period is estimated at four years. The Cove project PEA is based on indi- cated mineral resources of 1 million short tons (st) at grades of 0.327 oz/st gold and 0.861 oz/st silver and inferred mineral re- sources of 4 million st at grades of 0.328 oz/st gold and 0.609 oz/st silver. The mine will be accessed by a single ramp extending from surface (elevation 4,625 ft) to the lowest extent of planned mining (elevation 3,430 ft). The ramp will be large enough to accommodate 30- st trucks. A series of raises will provide secondary egress and ventilation. A min- ing contractor will extract the mineraliza- tion using drift-and-fill mining methods at an average rate of 1,270 st/d. Northern Nevada hosts three roasting facilities and two pressure-oxidation facil- ities that could process the Cove mineral- ization. The PEA assumes toll-milling ar- rangements with associated over-the-road trucking costs for both process methods. The Cove project hosts an historical open-pit mine operated by Echo Bay Mines between 1987 and 2001, which produced 2.6 million oz of gold and 100 million oz of silver. The project benefits from signifi- cant historic geological datasets; proximity to paved highways and electric power; and pre-existing mine infrastructure. The project PEA assumes mining of mineral resources in the Helen and Gap deposits only. Potential exists to increase these mineral resources as the deposits remain open for expansion. There is also potential for adding resources from the Cove South Deep and 2201 zones follow- ing underground exploration and delinea- tion drilling. These opportunities will be reviewed during an underground develop- ment and exploration drilling program. The Cove project is permitted to de- velop an exploration ramp, complete un- derground diamond drilling, and test the mine up to 120,000 st of potentially eco- nomic mineralization. Baseline studies, final permitting and a feasibility study are planned for 2019-2020. Newmont Forms Strategic Partnership With Maverix Newmont Mining has entered into an agreement to sell its royalty portfolio to Maverix Metals, an emerging precious metals royalty and streaming compa- ny. In connection with the transaction, Newmont will receive 60 million Maverix common shares, representing an owner- ship interest of approximately 28%; $17 million in cash; and warrants for an addi- tional 10 million common shares. Newmont's royalty portfolio includes 54 precious metals and industrial minerals roy- alties, including royalties at TMAC Resourc- es' Hope Bay mine in Canada and Premier Gold's McCoy Cove project in Nevada. 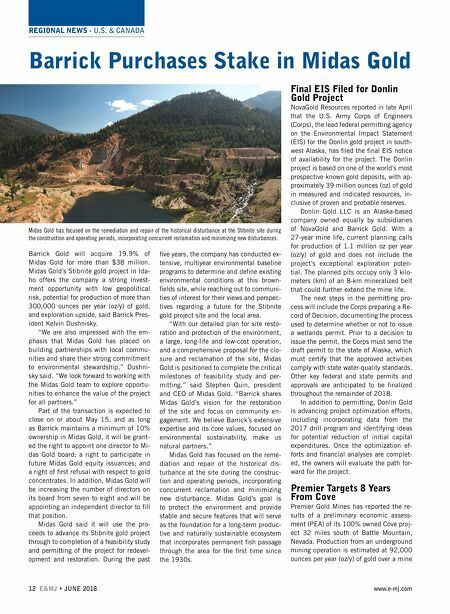 "Our strategic partnership and equity interest in Maverix generates value for both companies' shareholders," said Ran- dy Engel, Newmont's executive vice pres- ident, strategic development. 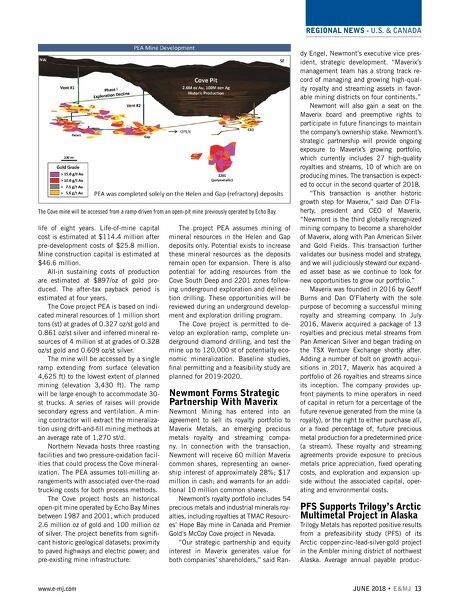 "Maverix's management team has a strong track re- cord of managing and growing high-qual- ity royalty and streaming assets in favor- able mining districts on four continents." Newmont will also gain a seat on the Maverix board and preemptive rights to participate in future financings to maintain the company's ownership stake. Newmont's strategic partnership will provide ongoing exposure to Maverix's growing portfolio, which currently includes 27 high-quality royalties and streams, 10 of which are on producing mines. The transaction is expect- ed to occur in the second quarter of 2018. "This transaction is another historic growth step for Maverix," said Dan O'Fla- herty, president and CEO of Maverix. "Newmont is the third globally recognized mining company to become a shareholder of Maverix, along with Pan American Silver and Gold Fields. This transaction further validates our business model and strategy, and we will judiciously steward our expand- ed asset base as we continue to look for new opportunities to grow our portfolio." Maverix was founded in 2016 by Geoff Burns and Dan O'Flaherty with the sole purpose of becoming a successful mining royalty and streaming company. In July 2016, Maverix acquired a package of 13 royalties and precious metal streams from Pan American Silver and began trading on the TSX Venture Exchange shortly after. Adding a number of bolt on growth acqui- sitions in 2017, Maverix has acquired a portfolio of 26 royalties and streams since its inception. The company provides up- front payments to mine operators in need of capital in return for a percentage of the future revenue generated from the mine (a royalty), or the right to either purchase all, or a fixed percentage of, future precious metal production for a predetermined price (a stream). These royalty and streaming agreements provide exposure to precious metals price appreciation, fixed operating costs, and exploration and expansion up- side without the associated capital, oper- ating and environmental costs. PFS Supports Trilogy's Arctic Multimetal Project in Alaska Trilogy Metals has reported positive results from a prefeasibility study (PFS) of its Arctic copper-zinc-lead-silver-gold project in the Ambler mining district of northwest Alaska. Average annual payable produc- The Cove mine will be accessed from a ramp driven from an open-pit mine previously operated by Echo Bay.